CTF is a uniquely British phenomenon and is often a confusing term to those who live overseas. However, the proliferation of British hobbyists on the internet means that it is becoming more and more common in usage although the huge competitive sections are still a feature unique to British live shows. CTF means craft, toy, foundation. CTF Plastic refers to models that are made of plastic (as the name suggests). This could include everything from Schleich to Grand Champions to My Little Ponies. These models are original finish (custom finish models would go in custom) with a few exceptions unique to CTF. Most shows will have a CTF section and this will often be split between plastic and bendy. If there is no CTF section the show holder may allow these models to go into original finish. Generally speaking when a show is split between CTF Plastic and CTF Bendy, everything that is plastic goes in plastic and everything that isn't goes in bendy. CTF Plastic tends to mainly include the more realistic solid plastic models, these classes are usually huge and very competitive. They may only cost a few pounds each but that means everyone can afford them! Most UK hobbyists will own at least one CTF plastic model, whether they collect them or not. CTF is a unique concept and as a result there are a few fuzzy areas. Most of these are governed by convention or left to the show holder and you simply have to learn these unwritten rules or check with the show host exactly what they want. I have duplicated this section in both the bendy and plastic sections as there is huge overlap. When customised these models stay in their original section. Why is this? 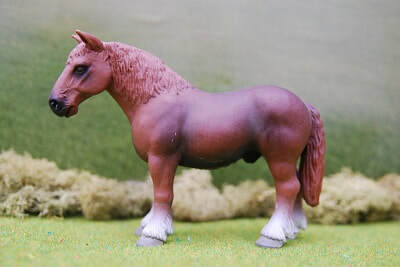 Well in the case of things such as Dream Ponies (Magpie) they were often sold as kits so the vast majority may be customs. Secondly there is an issue of realism of finish. It simply seems more suitable to have a Julip HOTY custom up against other Julip HOTY models than custom Breyers. This is because they are more similar in type to bendies (and in the case of Julip HOTY are the same brand) so it seems more sensible to put them in CTF Bendy rather than plastic. However, again check, not all shows follow this rule. A very small selection of shows have a section called 'craft collectable', this has been referred to as 'posh CTF' by some hobbyists, although a little derogatory it does actually explain the section quite well! Craft collectable is basically for expensive bendy CTF models that are more realistic. It would include non-Foundation Equorums, RubberNedz and Rydals. The idea being that these sculptures are of a standard much higher than say a Foundation Equorum or Julip Original and should therefore be judged separately.